REVIEW: Leo Tolstoy is an author we have all heard of and know we ought to read some day. War and Peace is on the same ‘to do’ list as Proust’s In Search of Lost Time, James Joyce’s Ulysses and Victor Hugo’s Les Miserables. When people think ‘big, difficult literary novel’, they think War and Peace . Millions who have never read the magnificent book will happily refer to it in their daily speech. When someone is slow in writing a text, say, or email, or shopping list, for that matter, the wag may be heard to ask – What are you writing,War and Peace? Anna Karenina is different, however. It has not the same reputation. Whereas War and Peace has a stage as large as Russia itself and is as densely populated, Anna Karenina’s stage is intimate, with no more than a few families involved. 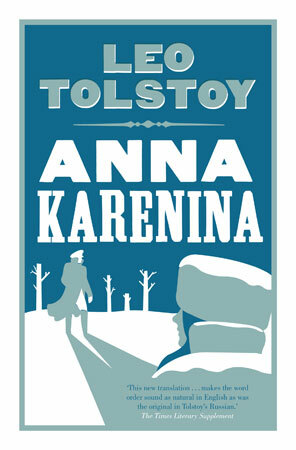 The subject of Anna Karenina is private and personal, too, in direct contrast to the public drama of Napoleon’s invasion of Russia depicted in War and Peace. To those readers who make their way towards Tolstoy, attracted by his reputation, War and Peace appears a monolith on the literary landscape, hewn out of granite, defiant and self-assured. As such, War and Peace represents the ultimate literary challenge, and its very presence, like that of Everest, excites countless attempts to conquer it. Alas, many readers never make it past base camp. Anna Karenina is not made out of granite. Anna Karenina can be conquered. Anna Karenina is read and re-read. There may well be more copies of War and Peace than Anna Karenina on the bookshelves of the world, but I feel confident in guessing that more copies of Anna Karenina have been read from cover to cover. Don’t misunderstand me, I loved War and Peace and recommend it to every reader. Both books must be read. Life is ordinary without them. But it is my experience that readers are more likely to read War and Peace if they have first read Anna Karenina, so I always recommend reading Anna Karenina first. Every new reader of Anna Karenina is a possible reader of War and Peace. That is why I was so happy to find the First Tuesday Book Club discussing Anna Karenina. They were planting the seeds for further reading. Each panellist spoke with such passion and enthusiasm, too. (I admit it, this book nerd got a little bit excited.) They all seemed to have forged an attachment to Anna Karenina – a very real and personal attachment, one which didn’t take kindly to being outshone by the attachments of their fellow panellists. And this is understandable. The greatest works of literature engage with us – we find we must become involved. And not just with the story or the theme, but with the process, too. When experiencing poor art part of our mind tends to switch off. We doze. We accept. Our critical faculties are awakened only by that which is good. We experience the finest works with all of our faculties firing; we wrestle with it – a real, bodily entanglement. Thus it is that we appreciate, though we may not entirely understand, the mechanisms under the surface, their power and their weaknesses. We also recognise that in every choice – of tempo, setting, colour, action, speech – there is the controlling mind of the artist. And we are conscious, too, that the work of art is excellent as we are reading it. This last, the consciousness of excellence, is, I believe, a source of pleasure. Great art makes us feel good. Both Anna Karenina and War and Peace are abundant, rich, intelligent; all of the characters within each are people, with all of a person’s difficulties, loves, hates and vagaries. A reader will do best to recognise that they cannot possibly take in all Tolstoy offers in one reading and read on regardless. Many failed attempts to read Tolstoy come through a desire to remember and understand all as one reads. This cannot be done. With Tolstoy in your hand you need nothing else. You have cheated the world. You hold one of the finest artistic achievements of mankind and there is not a security guard in sight. To my mind, the work is greater, grander, fuller than any painting and yet it is disregarded by merchants, collectors and dilettantes and its true value is never measured. The wonder of it all is that you need not be rich – you need not be successful – to read and own Anna Karenina. You can read Anna Karenina on the train, have it with you in the mud on the front lines, read it in a dank basement or in the open under a tree. Literature, like music, is one of the most egalitarian of arts because it can be shared in its original form – it is the more valuable, not the less, because it can be reproduced cheaply and thus be experienced, first hand, by all.